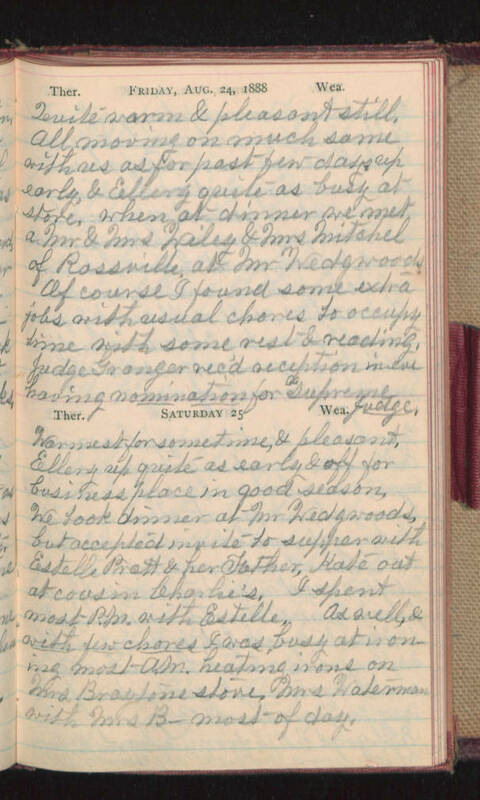 Friday, Aug 24, 1888 Quite warm & pleasant still. All moving on much same with us as for past few days, up early, & Ellery quite as busy at store. When at dinner we met a Mr & Mrs (Lailey?) & Mrs Mitchel of Rossville, at Mr Wedgwoods. Of course I found some extra jobs with usual chores to occupy time with some rest & reading. Judge Granger rec'd reception in eve having nomination for a Supreme Judge. Saturday 25 Warmest for sometime, & pleasant. Ellery up quite as early & off for business place in good season, We took dinner at Mr Wedgwoods but accepted invite to supper with Estelle Pratt & her Father, Kate out at cousin Charlie's. I spent most P.M. with Estelle. As well, & with few chores I was busy at ironing most A.M. heating irons on Mrs Brayton's stove. Mrs Waterman with Mrs B- most of day.